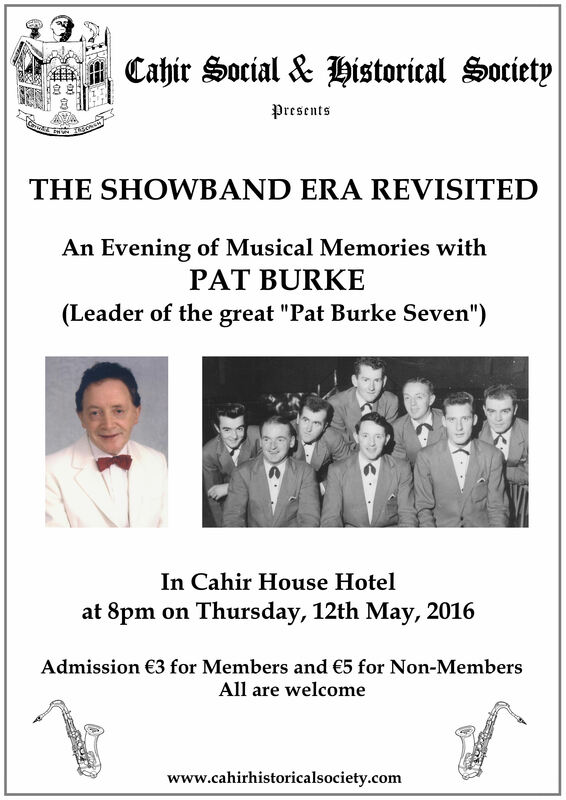 On Thursday night, 12th May, the Cahir Social and Historical Society will host a very special occasion when the "Showband" great, Pat Burke, returns to his hometown to talk about the heyday of the "Showband" scene in Cahir and also perform some of his favourite songs. At 89 years of age, Pat is hale and hearty and still performs in Cork, Clare, Waterford and Tipperary. He was a brilliant saxophone player before he formed his own band, known far and wide,as "The Pat Burke Seven". A number of his band members, such as Liam McLoughlin, Bobby Johnson and Vincent Bray continue to live in Cahir and we hope they will re-unite to perform a number or two on the night. He saw it all from his vantage point on the stage and Pat has many stories to tell of ballrooms with mineral bars only and parish priests separating the men from the women! This should be a great night in Cahir House Hotel and it will be an opportunity, also, to honour a legendary musician and band leader from the town. We hope to see you at 8pm on 12th May. Admission €5 Non-Members and €3 Members.